Make the most out of your archive with easy, space saving equipment. Access your archives with just a click. 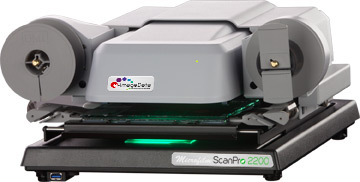 ScanPro Scanners make working with microfilm easy, productive and fun. Let Active Data Systems outfit your business with the technology used by the world’s most prestigious libraries and corporations. Contact us today if you would like to learn more about any of the scanners we offer. The compact system can be networked to computers and/or touch screens for ease of use and space savings. Get a clear, crisp image with real-time viewing and image adjustments. Each ScanPro 3000 features a 26-megapixel camera1 that provides exceptional image quality and the ability to zoom and adjust color, brightness, contrast and focus. 1 The ScanPro 3000 (or ScanPro i9300) high performance camera uses advanced pixel-shifting technology to capture higher megapixel images. e-ImageData starts with its 6.6 megapixel image sensor, largest in the industry, to capture and integrate 4 unique optical images into a single 26 megapixel camera image, the clearest image in the industry. The compact system can be networked to computers and/or touch screens, for ease of use and space savings. Automatic scanning can be used for a partial roll or an entire archive. Users can create a word-searchable PDF file. For high speed, high quality image scanning, reliable document handling and superior durability for the entire office. 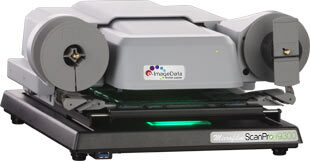 For high speed, high quality image scanning, reliable document handling in a smaller size with easy to use features. For convenience and flexibility and exceptional scanning performance that fits on a desktop. For easy to transport scanning equipment that can be taken where you need it, anywhere in the office. As a network scanner, the plustek eScan (A250 FileDirector Edition) allows you to can scan and send your documents such as bank statements, invoices and contacts directly to FileDirector, USBs, or other storage systems.